Why do herons stand on one leg? Some scientists believe unipedal rest allows the chilly bird to retain body heat, while others think that the one-legged profile makes the bird look less like juicy prey. By integrating balance and postural alignment, The Heron Pose also greatly benefits humans. Good balance and proper posture allow us to age with grace and dexterity. I like the Heron Pose because the mild stress associated with balancing provides gentle biofeedback for students who are trying to learn how to remain calm under stress. * Observe your breathing pattern: does it change when you struggle to keep your balance, or when you begin to fatigue? Do you maintain a steady and deep diaphragmatic breath throughout the exercise? If you cultivate steadiness of breathing while balancing, you will also improve your ability to maintain equanimity in your most challenging moments, like when you are attacked in a bar, or worse still, when your partner fails to wash the dishes and take out the garbage. In order to emphasize the relationship between breathing and balancing, I suggest that you practice the breath work in my previous post before beginning this exercise. The Heron Pose Video: I demonstrate the relationship between this exercise and Aikido techniques, including nikkyo, kokyunage, and iriminage. Warm up exercise for the Heron pose: Emphasize a long, fluid back and energy projecting from your spine, from your center (below your navel), and out the fingers. Keep your weight in your heels, engaging your quadriceps throughout the motion. Raise your body and arms, and then drop your center, bending at the knees while your arms also swing to your sides. Stay in your back body by shifting your weight back into your hips, as if you are about to sit in a chair. Your knees soften and release. Visualize your lower spine and center generating power for the swinging motion of your arms. Shoulders remain relaxed, chest broad. Lower spine lengthens downward and releases throughout the motion instead of arching. The rapid movement of your arms have a pleasant centrifuge effect, sending more blood to your fingers. This is a great way to wake up if you are feeling sluggish. Balance on one leg, standing tall. Head and spine lengthens towards the sky, and imagine that you are rooting the supporting foot deep into the earth. Move with the breath: on the exhalation, lengthen your spine, extending the back leg as a counterbalance to the downward movement of the head and torso, like an Texan oil pumpjack. Some people arch their lower back and puff out the chest; instead, visualize your lower ribcage moving backward, towards the spine, and the spine lengthening and releasing downward, from the center of the back through the tailbone. Lengthen and soften the neck to allow the head to drop slightly downward at the end of the movement so there is no strain in the neck. Allow the leg to move into a horizontal position, and let the arms release with gravity, open hands dangling like ripe fruit. I suggest allowing the knee to soften slightly, with the knee bent (you can straighten your leg if you understand how to engage your kneecap, but that is outside the scope of this journal entry). With the inhalation, slowly return to a one-legged standing position, head towards the sky, and repeat until you begin to lose your balance from muscular fatigue (or continue practicing until you fall over!). Figure 1. Heron pose at the end of exhalation. 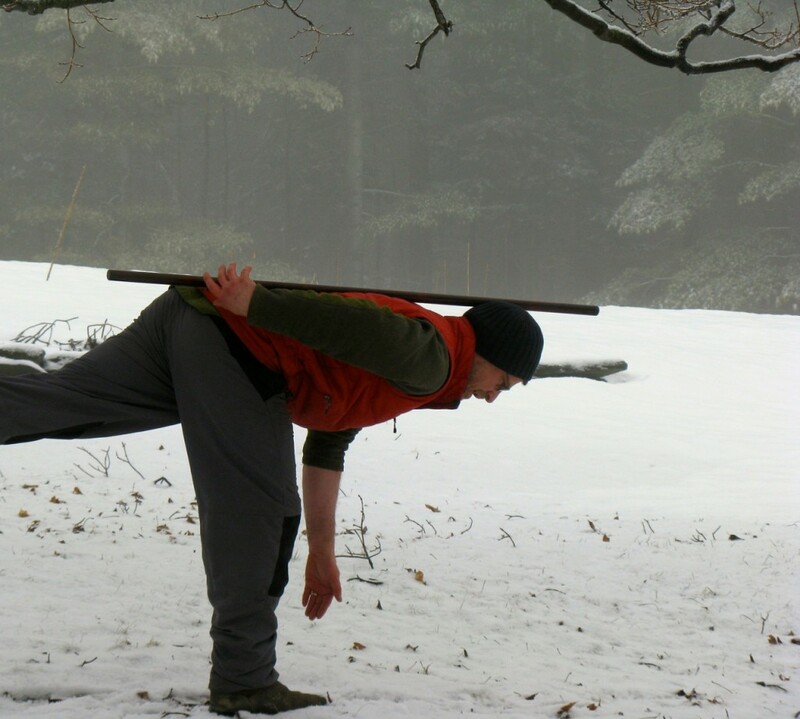 You can balance a staff on your back to cultivate and awareness of the spine. Note that the staff does not quite touch the back of the head throughout the movement, reducing strain on the neck. Other people round the chest and the spine; the head falls forward too quickly and the back collapses. Instead of leading with the weight of the head, allow the entire spine to lengthen. Make sure you look forward and out rather than downward as you initiate the movement. This is a good time to practice what martial artists call enzan no metsuke, or gazing at distant mountains. This refers to the importance of maintaining a soft, steady gaze that allows you to see the whole picture rather than focus on one element. For instance, if you watch someone’s clenched fist, your focus might mean that you won’t notice her other striking hand. A modern example of enzan no metsuke would be your ability to see that your opponent has on a grey t-shirt (the general picture) rather than read the fine print that encourages you to “shop at MalWart” (obsessive focus). So make sure that you initiate the movement with this gentle and receptive gaze. Make this pose more challenging by raising the arms on the inhalation, and dropping them towards the floor on the exhalation. Try not to touch the floor unless you lose your balance. Other ways of making this pose challenging is to close your eyes throughout the movement, or train on an unstable surface. You can also pick up an object, like a tennis ball, and then put it down again, varying the ball placement. Try this with your eyes shut! 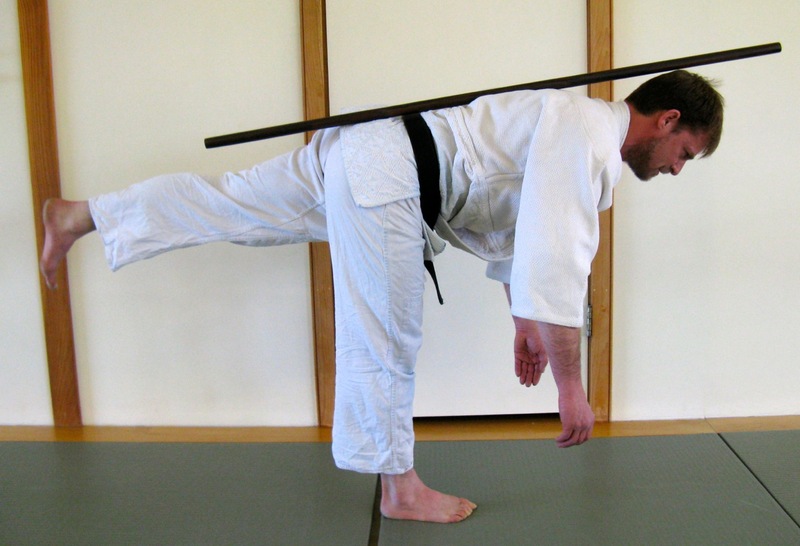 You can also hold onto the staff with one hand (see figure 2), and then release, attempting to balance the staff on the back (see figure 1). Another method to work on spinal alignment is to strap a staff on the back around the waist with a belt or yoga strap; this is nice because then you can focus on the movement rather than on balancing, and return to the upright position without holding onto the staff. Figure 2. Holding onto a staff with one hand. You can also let go of the staff and practice two balancing tricks at once, see figure 1. Or strap the staff to the back with a belt around the waist. Note that the staff touches my head; in the final pose, lengthen the crown of the head away from your tailbone, and the head won’t touch the staff. If this pose is too challenging, one can practice with the back foot touching a stool or a wall, or you can gently touch a wall or railing for support. Or you can keep you foot close to the floor, rather than raising the leg to the horizontal position. Training on a firm surface also makes this exercise easier. Heron Pose, Part 2: Opening the hip. An integral aspect of Aikido is learning how to “pull” the hip in order to narrow your stance and evade an attack. Make sure the big toe and inside of the heel of the front foot line up with the big toe of the rear foot. In this position, you should feel like your back hip is pulled, or is moving towards your back heel. Your center (the buckle of belt or the knot on your obi) should face almost perpendicular to your front foot, rather than forward. Inhale and raise your front arm like a sword above the head. On the slow exhalation, ground the blade of the back foot (the outer length of the foot from the little toe to the back heel) as you exhale and extend your arm downward, towards the floor. If possible, keep both legs extended. If you cannot lengthen and release the spine with your front leg straight, bend the front leg, and make sure the knee is in alignment with the center of the forward foot. The back leg remains long throughout the movement. Release your head at the very end of the exhalation, hand reaching to the floor, while the back of the neck softens and lengthens. Then practice this movement by inhaling and raising your back foot, squaring your hips at the apex of the movement. Imagine that the breath initiates the movement. As you inhale, extend the forward arm above you, and raise one foot. As you exhale, cut down with this extended arm, pulling your hip back and away from the front. Imagine your arm is a sword. Begin with enzan no metsuke, but release your forward gaze at the very end of the movement at the end of your exhalation in order to reduce strain on the neck. Now we are ready to practice the same body movement with both feet grounded. Instead of narrowing your stance, you should stand in aikido hamni, feet separated a bit more than your shoulder’s width, and your heel of the front foot in line with the instep of your rear foot. Arms internally rotate as you bend forward. This movement teaches proper alignment for iriminage (entering throw) and for a proper Aikido forward roll. A fun exercise: throw someone and then go into a forward roll afterwards (see the end of the video above). This movement can also be called “pumpjack pose,” because it resembles the motion of a Texas oil well piston pump. It also evokes the yoga asana Virabhadrasana, or Warrior Pose III, but instead of holding the pose with the arms extended, you continually move with the pattern of the breath from an upright position to a more horizontal position, with the arms dangling downward. 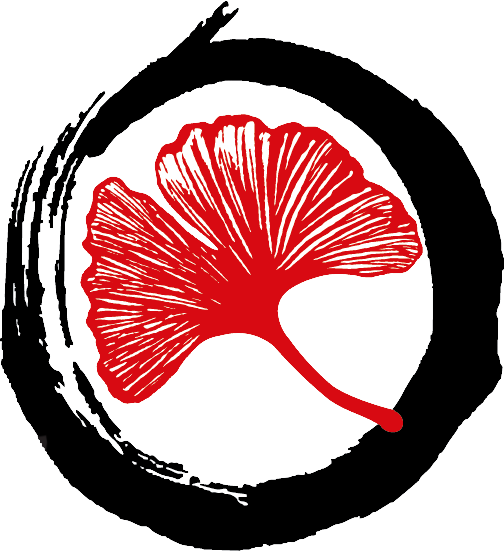 *Many traditional forms of budo attempt to teach relaxation under stress through intensive training, with significant martial intensity. I find that this method works for the rare few. Most of us need more supportive transitions, in which the student feels a degree of control and safety within the practice. Then, teacher and student gradually increase intensity in a sensitive and positive manner.